Once Dominant, Netflix Faces An Increasing Number Of Video Challengers : All Tech Considered With more than 100 million subscribers around the world, Netflix is the premier video streaming service. But, as competition from Amazon, Hulu and others heats up, can Netflix stay on top? Netflix CEO Reed Hastings delivers a keynote address at CES 2016 in Las Vegas. He has admitted facing Amazon in video is a challenge. Apple is about to close a deal with director Steven Spielberg to revive his Emmy award-winning series Amazing Stories for Apple TV. With it, Apple is entering a world in which Netflix has been a leader. But now, new competitors to Netflix are emerging at a surprising speed. It was just 2013 when Netflix's House of Cards starring Kevin Spacey was the breakthrough in streaming TV. It was the first online-only series to get nominated for major Emmys. But at this year's Emmys, The Handmaid's Tale, produced by Hulu, beat out House of Cards and became the first streaming TV series to win the Emmy for best drama. A year earlier, Netflix barely had to think about Hulu. Now, it's one of a growing list of competitors, says Mark Suster, who invests in video. "You not only have Amazon, but you increasingly are gonna have Spotify, and you have Apple and you have Comcast," he says. "There are so many people that will be moving into this space." This means a lot more content to watch for viewers and a lot more outlets for creators. But Netflix does have an edge since it was the first player in this market, says Sid Ganis. He's a film and TV producer and the former head of the Academy of Motion Picture Arts and Sciences, which gives out the Academy Awards. "Because they had a start on everybody else they're pretty much the Big Boppers today," he says. "They're still the ones that we think about first before we think about the others." Ganis is talking about producers, creators — everyone who makes entertainment. But he also says there's frustration with how Netflix changed Hollywood's business model. Before Netflix, if you created a show or a film you got paid more if more people watched it. But Ganis says since Netflix doesn't reveal how many people watched a film or show, it gives people an upfront fee and it doesn't matter if it's a hit. "The deals are different, meaning with the success of the movie, the remuneration for the artists, producers, writers," Ganis says. Suster, the investor, says he's hearing a shift in how creators feel about Netflix. 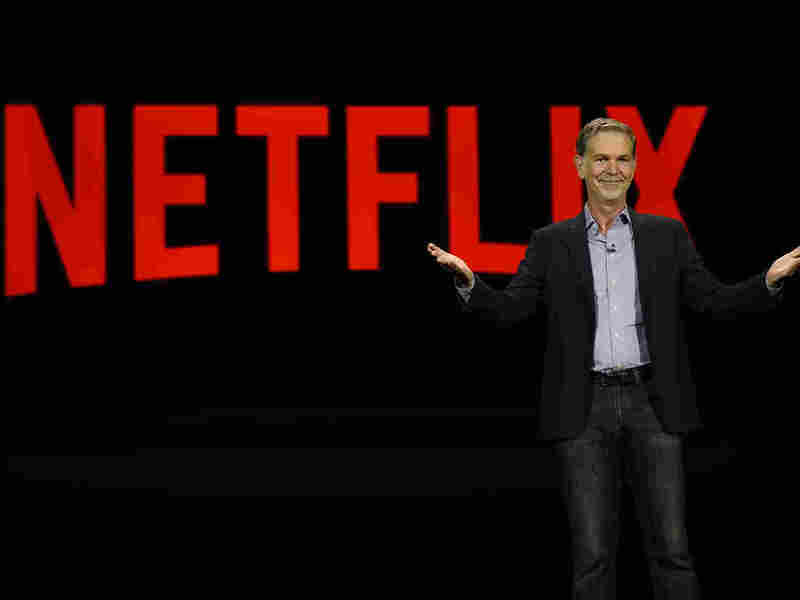 "As I understand it people were very happy with Netflix in the early days, but now Netflix has so much relative power that your ability to make money on the back end is reduced," he says. Suster sees an opening for competitors with more money to grab the best talent. Netflix does not have the deepest pockets, even though it's got 100 million subscribers around the world paying monthly fees. On the other hand, Apple is the most valuable company on the planet. And it doesn't need big profits from entertainment because it's got the iPhone. Hulu is owned by Disney, Time Warner, Comcast and Fox. But, Suster says, Netflix's biggest competitor is Amazon, which uses video to draw people to its retail store. "In a world in which, because I'm making money from you in so many different ways, I don't have to make as much money on my video subscription," Suster says. "It's going to be very hard for Netflix to compete going forward with Amazon." Netflix declined a request for an interview. But at the Code Conference in California, Netflix CEO Reed Hastings admitted that facing Amazon was a challenge. "What we can be is the emotional connection brand, like HBO," he said. "So think of it as they're trying to be Walmart, we're trying to be Starbucks. So super-focused on one thing that people are very passionate about." And while all this competition may not bode well for Netflix's bottom line, the fun has just begun for those who are enjoying the world of streaming entertainment.